By guest blogger Christina Gorczynski. In May, I attended a yoga retreat at the beautiful Retreat in the Pines, a gorgeous property in East Texas. I had just completed my second triathlon season with Team in Training and was busy with work, volunteer obligations, Leadership Houston and everything else I generally have going on in my life. Needing a break, I thought “A long road trip provides excellent, satisfying quiet time and yoga is a powerful was to decompress and recenter.” So a yoga retreat in the woods it was! This post is written by Kay, who recently found relief from a chronic headache at a Yoga Nurture Retreat. She’s since been back several times. But isn’t that the way many of us—and by “us” I mean Americans—live our lives? We tend to plan events so that we can “check in” on Facebook, take pictures, and say we were there. Sometimes we’re so focused on taking the picture that we forget to actually experience the thing we’re photographing. Once our event is thoroughly photographed and Facebooked, we move on to plan the next one. The lines quoted above come from a beautiful poem about enjoying a moment and letting it carry you through months of everyday life and stress. It’s easier said than done. Most of the guests at the October retreat had been to Retreat in the Pines before, two were even back for a third time. It was an amazing weekend. There were guests from San Antonio, the Dallas area and Houston. I am honored and humbled by the comments and appreciation. I am living my passion, which is to give women a place to escape their busy lives and take time for themselves…to nurture themselves…through the healing power of yoga and nature, the kindness and compassion of other women, the comfort of good food, wine and laughter. The first comment below is from a first time attendee, the second comment is from a woman who was here in July and came back. There is a common theme among guests who come to a Yoga Nurture Retreat weekend and take the time to write a comment in the guest book. Most say they loved it and can’t wait to come back. Here are some comments from the very happy guests. 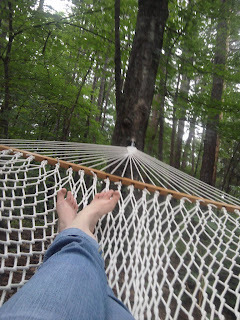 Pema Chodron book to read while lying on a hammock in the woods… Check! This post is written by Beki who attended a Yoga Nurture Retreat in May 2011. I just turned 50 years old this past May. As a gift to myself for my 50th birthday, I went on a weekend long yoga retreat to Retreat in the Pines in late May. One of my dear friends, who also happens to be my best yoga buddy, went on the weekend retreat with me. I think this weekend yoga retreat is probably the best gift I have ever given to myself. I could go on and on about the food (delicious), the setting (beautiful), the weather that weekend (perfectly gorgeous), my time in the hammock in the woods looking up at the blue sky through the pine trees (sublime), and the yoga classes (just right). But what has stayed with me is not what I took away from the experience, but rather what I left behind. The drive to the yoga retreat this weekend was less than stellar. A massive (read: insane) thunderstorm accompanied me the entire drive east. Rain falling sideways. Almost non-existent visibility. Lightning striking the ground next to me. White knuckles on my steering wheel. Flooded streets. Wind gusts pushing my vehicle from one lane to the next. I laughed, in spite of my fear. I recalled preparation for Savasana – the final relaxation pose in yoga. Commonly, we go into the final pose by taking each muscle into tension, then relaxation, bit by bit, from the bottom of our feet to the top of our heads. When I arrived, I was greeted with a glass of wine, a plate of freshly prepared, scrumptious dinner, and smiling faces from strangers… who would soon become friends.